Joomla is a very popular content management system. It is an open source platform, which allows people from around the world to make edits and improvements, many of which get implemented into future official release versions of the program. The platform is quite easy to use and is very customizable, which means you can make just about any type of site with it. Another really nice thing about Joomla is that it is well supported and frequently updated. This is very important when it comes to content management systems because updates are needed to implement new features, prevent security problems and much more. The platform is completely free to download, install and use for as long as you would like. There are some premium plugins, themes and other items that you can purchase if you would like. Blogging platforms don't get this popular if they don't have something good to offer. Having lots of users also means many people are there to help work out any issues. Joomla has an SEO customization feature built right in. While it isn't the most powerful option out there, it gets the job done. You can set permissions on many different things concerning your site. This will give you direct control over what every user of the site is able to do. While images and videos will look great on your site, they are difficult to manage on the back end. Resizing and moving is a hassle. Hopefully this will be addressed in future versions. If you get an error message in Joomla it can be quite cryptic. While you can typically figure it out with a few Google searches, they should really do a better job at making it clear what is wrong. Most people won't mind this (or even notice it) but Joomla has done a terrible job with versioning. You can fix this with plugins, but it really should be native. On the one hand installation and getting your site to the point where it can display something to your users is exceptionally easy. Just fill out a couple boxes and click a few times and you are live. Publishing your initial posts is also really easy. On the other hand, however, there are a lot of settings that you will want to go through and adjust before you really get started. I would consider this a part of the initial setup. While it is certainly not difficult, it can be time consuming. There are thousands of plugins available for Joomla, many of which can really make your site great. The plugins are really easy to find, install and manage through the back end control panel. Joomla was clearly designed with plugins in mind so it is no surprise that there are so many available. Themes are an essential part of Joomla so it is not surprising that there are so many available to choose from. The themes allow you to dramatically change the look and feel of the website so it can be uniquely yours. Just about every good Joomla site will use some type of third party theme. You can customize just about everything to do with your Joomla site. This is obviously a good thing in that it gives you the power to make your site into exactly what you want. For some users, however, it can be overwhelming since there are so many options you need to consider. Within the control panel, for example, there are many menus to go through to find all the different settings and option that can be adjusted as needed. If you take your time and look through them all, however, you can really ensure your site is exactly what you want it to be. Joomla is quite SEO friendly out of the box and has a few nice SEO options that you can adjust as needed. If you are looking to have more granular control into the SEO of your site, you will need to go find the right third party plugins to make that happen. Fortunately, there are quite a few SEO related plugins available to choose from so it shouldn't be hard to find the right one. Joomla is completely free to download and install. You can use it in any way you would like without having to pay. If you want any type of professionally designed plugins or themes you will need to hire a developer. Developers for Joomla are quite affordable since there are so many of them out there. There are also some high end plugins and themes that you can buy either as a onetime fee or a monthly subscription. 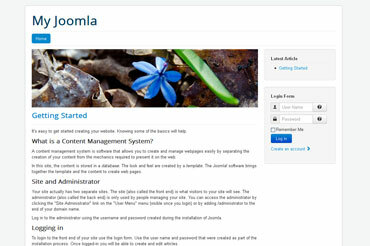 Joomla is one of the best content management systems out there. It is well managed and frequently updates so you'll always have access to the best features around. The platform has also been around for a long time and has a proven track record of quality so there is really very little that you would need to worry about. If you're looking to start your own website, Joomla will make a great platform to build it on. We keep up to 30 daily backup copies of your Joomla site.